The action of auto polo was guaranteed to “make spectators’ hearts pump at 60 miles per hour.” Photo thanks to Library of Congress. Have you ever guided an open-framed automobile at the rate of 40 miles an hour through a jungle of pine trees while a wild-eyed passenger riding shotgun accurately lops off the branches of the passing trees with a scythe? If so, then you can appreciate what it was like to be a driver in the most exciting and dangerous spectator sport in the early 20th century – auto polo. Auto polo arose as the “must see” event after it was first played in Kansas in an event sponsored by Jones Auto Exchange, of Wichita, Kansas, in July 1912. Jones employees Carl Evans and Roltz King had created a new form of auto polo, building on a concept originating in Massachusetts in 1902. 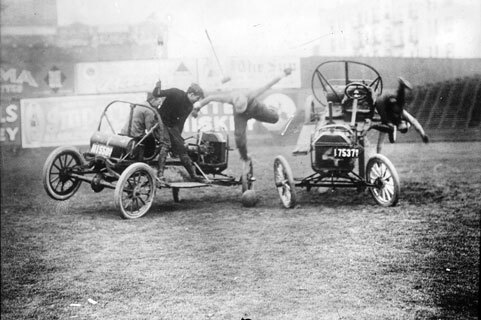 The earlier version utilized a one-seat steam powered car called a “runabout”, with play taking place in an area roughly the size of a football field where participants hit a ball approximately as big as a basketball. This new version was played using Model T cars stripped down to the frame to allow for higher speed and better maneuverability. Each car consisted of a team of driver and mallet man. The mallet man often balanced himself on the edge of the vehicle to take a swing at the ball while the driver maneuvered the vehicle. Jones Auto Exchange’s business manager, Ralph Hankinson, was the man who would successfully promote this exciting spectator sport in its new form. Ralph “Pappy” Hankinson was the first child of Euro-American ancestry to be born in Russell, Kansas, in 1879. After his schooling, Ralph traveled and worked at various jobs, and then jumped in on the ground floor of auto sales in 1907. It was during this time that Ford Motor Company was preparing to release the first mass-produced automobile, the Model T, at the end of 1908. Ralph found employment at Jones Auto Exchange, a company that became one of the top sellers of Ford vehicles in the early days. Jones did so well selling Ford vehicles that they built a large warehouse, the largest structure of its kind in the Midwest at the time, from which to sell automobiles and refinish and repair all facets of the automobile. An ad in the Osage City Free Press, May 27, 1915, introduces the competing auto polo team members and promoter, Ralph Hankinson. 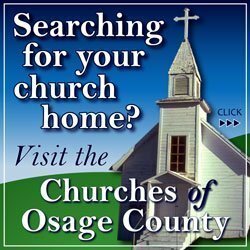 The Osage City showing would feature a showdown between the American and Britain teams. Each team had four players in two cars. The American team consisted of Walter “Blondy” Sterling, who had participated in more polo games and more serious accidents than any other, and his mallet man, Charles “Original Ad” Adams, had originally had a career as a steeplejack in New York City, swinging from six-foot beams 40 stories in the air. The British players had been attracted to the game when Hankinson brought the sport to England and signed the men to a three-year contract. Driver Ray Lampkin was a veteran of the British Navy. Prior to the anticipated show date in Osage City, Lampkin’s mallet man Ray Claypool had been violently thrown from his vehicle, which required weeks of recuperation and had turned his hair gray from the shock of the injury. Rain forced the sport to be delayed in its Osage City showing in spring of 1915. Hankinson and his auto polo group continued with their tour to multiple fairs and an 18-game series at Madison Square Garden. 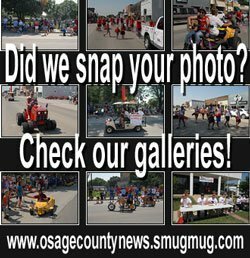 Rescheduled plans for two Osage City matches were made to accompany the fall festival, to be held in October at Granstrom Park at the west end of Market Street. The hype promised to make spectators’ hearts pump at 60 miles per hour for a fifty-cent admission fee. Auto polo ultimately thrilled Osage City citizens for only one performance. The sport continued to be a hit for the majority of the next decade, waning in popularity with the Great War and the high cost for such a production, not to mention the sheer danger involved. Ralph Hankinson went on entertaining the crowds but shifted to car racing, and later became involved with Eddie Rickenbacker, World War I flying ace turned race car driver. Auto polo attempted a revival after World War II in the Midwest, but never reached the popularity it had enjoyed earlier when Ralph Hankinson brought it to towns like Osage City. 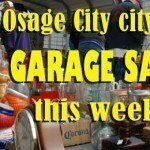 Though only one match was ultimately played at Osage City, local merchants used the event to promote their bargains and attract the expected crowds to their stores. The Howard Merc. Co. advertised a special sale day for the auto polo match in the Osage City Free Press, May 27, 1915.